Ring-a-ding-a-ling, now music joins the first rolling fun. All ball track pixies will be delighted with this exciting feature of My first Ball Track: as the effect ball rolls along the metallophone or passes underneath the sound tubes lovely tunes will be produced. It's a lot of fun and also stimulates auditory skills. 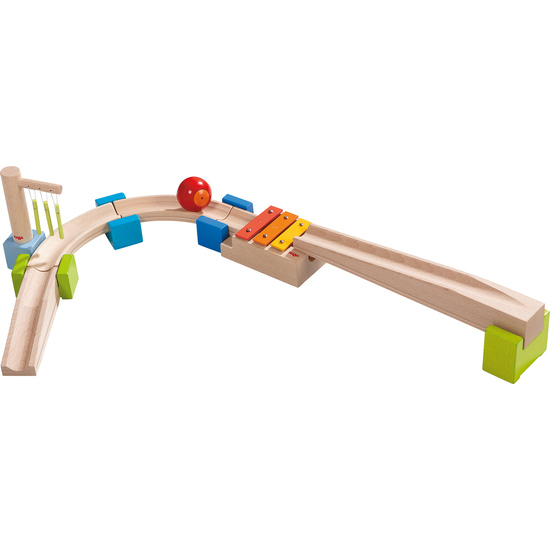 Contents: 2 ramps, 2 curves, 4 colored connection blocks, 1 xylophone block with connecting track, 1 sound tube block, 1 effect ball with little bell.